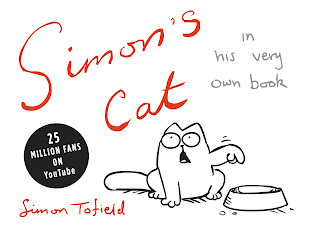 Fans of Simon Tofield's videos of Simon's Cat will love this book that comes out on September 24, 2009. The book, Simon's Cat, captures the lightheartedness and humor of the escapades of the video shorts. The graphics are simple but enchanting. A sure hit with cat lovers, even those of us without pets are sure to enjoy the playful stories and naughty tricks that Simon plays on the family dog, neighborhood birds, and his "master." I particularly like the frame with the cat and the frozen birdbath - silly but hilarious! Publisher: Grand Central Publishing (September 24, 2009), 240 pages. If you'd like a copy, sign up for my contest! Thanks so much, Anna and Hatchette Book Group for this opportunity!